Bond was going to tank in 1989, no matter what. For all those who say that Licence To Kill is too dark, or too violent, or that Dalton is too grumpy in that movie, or it's too Miami Vice or some such thing and that's why the movie tanked, you're missing the bigger picture. A new Bond movie had been released every two years for the previous 22 years. The market had become oversaturated. People were going through Bond Fatigue. Bond was beginnig to be seen as old hat. Been there, done that. No matter how good the movies were or werent by 1989 the excitement among the general moviegoing public had waned. Then you've got the Summer of 1989. Batman. Indiana Jones and the Last Crusade. Lethal Weapon 2. Star Trek V. Ghostbusters 2. The Abyss. James Bond was going to get lost among those movies regardless of what kind of Bond movie it was, or who was playing Bond. Timothy Dalton might have had a better run if they had waited another year to do Licence To Kill. Bond needed a break, or, more accurately, the general moviegoing public needed a break from Bond. Pierce Brosnan benefitted from that break as the public was once again ready (viewing a new Bond movie as long overdue by then) and excited for a new Bond movie by 1995. I think your perspective, B5Erik, is too narrow. Of course, that summer Bond got lots of tough competition. But THE LIVING DAYLIGHTS was performing pretty well two years ago, Dalton was accepted as Bond. Would LTK have been better perceived in the fall or winter? Maybe. But what hurt it the most was not oversaturation but being out of touch with the zeitgeist of that era. Let´s face it, LTK is a very straight forward revenge story with action scenes that did not top anything else released during that year. It actually paled in comparison. Nowadays we appreciate LTK´s grittiness and its down-to-earth action. But in contrast to FYEO, which also downscaled and tried to be more of a traditional spy story, LTK did not appeal anymore to the fun factor that was bringing in family audiences around the world. That was its problem. I believe that people would have wanted to see a new Bond adventure had LTK been a kind of "The Living Daylights 2". It wasn´t. And audiences who wanted to see a tough action thriller preferred LETHAL WEAPON 2. Edited by SecretAgentFan, 01 December 2012 - 06:57 PM. 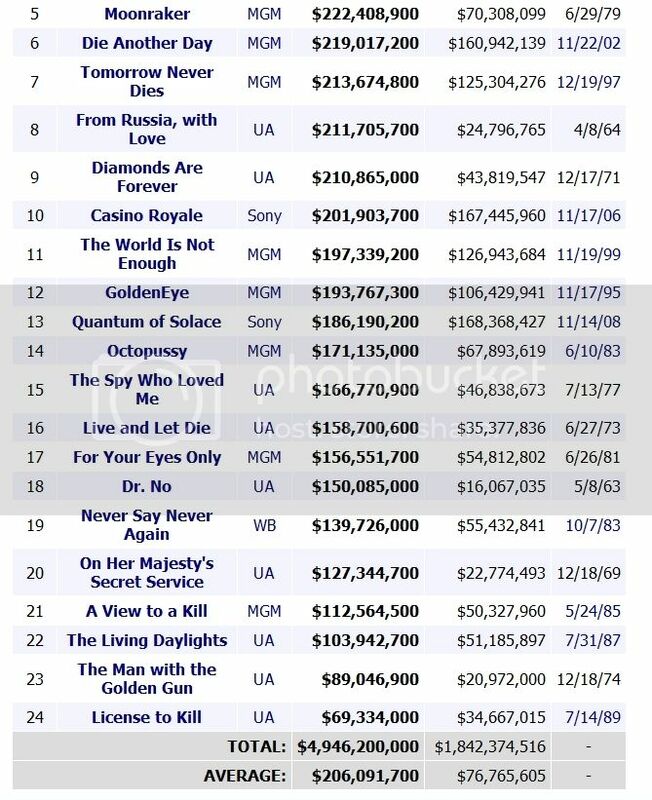 The Living Daylights did OK at the box office, but did less than A View To A Kill in the U.S. - that was the second sign of Bond Fatigue (the first being AVTAK's slightly disappointing U.S. box office numbers). American audiences just didn't care about Bond by 1989. Keep in mind the fact that LTK had the highest test scores of ANY Bond film tested up to that point. EON and UA thought they had a hit on their hands. But, to your point, those who wanted a tough action thriller went to Lethal Weapon 2. Those who wanted larger than life action went to Batman or Indiana Jones. LTK was released in the middle of all that, and with the other movies I mentioned all being released within a month of LTK there wasn't much room for Bond to develop an audience due to word of mouth - everyone already had the movies that they wanted to watch picked out a month or more in advance, and since there were a zillion Bond movies on TV all the time going to the theater to watch yet another Bond movie just wasn't very appealing to most people. They could have released Goldeneye that year and it wouldn't have done much better than LTK. Marginally? Yes, quite probably, but significantly? No. On this I think the opening post is for the most part right. Given the choice between, say, Batman 1, Indiana Jones 3 and "Bond 16" (or 17 if you count NSNA from the 80s run), filmgoers in the summer of 1989 went for the newer, and in the case of Batman greatly hyped, over the tried and tested. Perhaps the summer period was the wrong time of year to release LTK. I think there were other factors as well which hampered the film - the writers strike didn't help. It's notable that we haven't seen a summer release of a Bond film since. Then again, I've argued elsewhere on this site that a new Bond in Timothy Dalton might have been an opportunity to bring in a new writing team and director. What we got with both Dalton films was an actor pulling the character in one direction working with a team many of whom were used to creating a much lighter version of Bond. With TLD it didn't show so much - the dropping of one or two incongruous scenes such as the "magic carpet" stunt and Dalton's outstanding performance made this a superior debut film. But with LTK it is as if the existing team were trying too hard to be tough in parts while retaining what they were used to in other scenes. That said, both Dalton films rate highly with me, and in the present day Bond series I think one can see what the film makers were perhaps trying to achieve twenty five years ago. I completely disagree and it didn't tank, it still made money. Not in the U.S. it didn't. Yes, thanks to the worldwide market LTK was profitable, but the box office numbers for the largest single market were very disappointing. And that was disappointing to me as I loved LTK and Dalton then, and I still love LTK and Dalton now. And it's a shame that a lot of people in the U.S. went to see the inferior Lethal Weapon 2 for an action thriller rather than Licence To Kill, which was a far superior movie. LTK was going to tank from the start because it was going up against Lethal Weapon 2 and other films and because there were to many Bond films out? And LTK's box office in the US only equaled the films budget which makes it a 'tank' if you don't take into account its worldwide gross? Both B5Erik and SAF have good points. LTK came out on the tail end of a trend of diminishing returns, quality notwithstanding, and to attempt to reverse the trend, they aimed directly at the emerging action style of the late 80s. Specifically, they targeted the styles of the Lethal Weapon and Die Hard franchises and attempted to stay topical by modeling the villain after Noriega and after the Medellin cartel, which were making lots of headlines at the time. Both Robert Davi and Grand L. Bush had been featured in Die Hard, and they also hired Michael Kamen, composer for both franchises. The problem was that they couldn't fully commit to that action style without making an 'R' movie, and that was never going to be permitted. Further, they were bound by the parameters of the traditional formula and had to shoehorn in the usual MI6 staff and Moore-era sight gags. As a result, the film doesn't comfortably fit into either mold, but feels like a half-attempt in both directions. I disagree. I love Bond but couldn't connect to Dalton. He was boring. He was dull. He wasn't good looking. After a certain point when you've got a new Bond movie every other year for almost 30 years a new one isn't exactly exciting for most people, especially during one of the bigger Summer movie seasons in history. Remember, the studio only gets about HALF of the box office gross (maybe a little more now as most movies are front loaded, but back then, certainly). Maybe. There had never been more than a 2 year wait between Bond movies. A 3 or 4 year break would have seemed like a much bigger deal at that point. Certainly a big part of Goldeneye's success was due to the 6 year break. People were ready and eager for a new Bond movie by 1995. The same might have been true if EON had waited until 1990 or 1991 for LTK. You never know. But AVTAK had lower numbers than OP, and TLD had lower numbers than AVTAK. The returns were already diminishing prior to LTK. I think there's some truth in the OP. LTK was suddenly competing in a very tough action market, not to mention a crowded summer-movie tentpole marketplace that gave films the opening weekend to make an impact or be pushed out by the next week's debuts. Add to that LTK was clearly attempting to mix it up with its competitors by being of their ilk also hurt. UA-MGM also made a hash of the marketing campaign. IMHO the posters since LTK have sucked, including SF's humdrum effort (though I'm fond of the QoS print campaign) and LTK (which had wonderful teaser posters) got stuck with poster campaign more in-line with a Steven Segal movie. And yes, marketing campaigns do matter in crowded marketplace where a large percentage of ticket buyers are making a spur of the moment choice after not getting into their first choice. And Bond was to an extent, old-news, especially in comparison to so many new franchises and new characters hitting the screen at the end of the decade. Summmer is an unforgiving time to release a film, and I don't think it was an accident that when GE was released they switched to Oct-Nov, when there is a bit more space to breathe and develop word-of-mouth. The last seven have done well with this release date and I think it would be an unneccessary risk to switch back to the summer. I like TD and LTK is a favourite of mine, but I do agree that Brozza had a wider appeal than TD. That being said, the 6 year gap also made a new Bond an event - something that had waned during the every-other-year cycle. I think SF is very good Bond film (I'm not ready to stack it up against the rest of the series yet - I wait until the next one comes out before doing so), but the 4-yr gap definitely helped hype audiences and critics, the latter who were primed to laud it. They knew during the making of LTK that it was going to be released in one of the biggest movie summers ever? And your saying they should have known it couldn't compete and waited it out? I don't consider it a 'tank' because it didn't lose money. There was no way they could have known. It was one of those inevitable things. The market had changed and they weren't going to find out until this happened. They still made money and they came back strong 6 years later, but it was clear that the cycle of a Bond movie every other year without a break had run it's course for a while. They might have been able to see the diminishing numbers, but they couldn't have known just how big Batman was going to be, and how much more appealing Mel Gibson was than James Bond to American audiences at the time. Remember, at that point ABC had been showing Bond movies on Sunday nights about 15 times each and every year. Going out to see a Bond movie wasn't all that special for American audiences anymore when they could just watch them on TV. It really was a case of oversaturation. People were suffering from Bond fatigue. No, it didn't lose money - but it was the point at which the Bond series bottomed out commercially. Even lower than OHMSS. Personally, I think it's one of the two best Bond movies (Dr. No being the other), but it just wasn't a big hit. Sorry, I fail to see your point. I think that it's pretty clear that Licence to Kill bombed at the US Box Office. There's not really any way to dispute that, and that's why it's labeled as a failure. As much as I like the film, it is my favorite Bond film after all, it didn't do well financially. Just like Lazenby before him, Dalton was rejected by the US audiences and they instead latched onto a much "safer" commercial choice in Brosnan. It's unfortunate that it happened that way, as I hold Dalton to be head and shoulders above the other Bonds, including Craig, but it's just one of those things. It's just a shame that they couldn't have gotten either Ralph Fiennes or Sean Bean cast in the role for GoldenEye. The point being that ANY Bond movie released in the Summer of 1989 was going to be a box office disappointment. Even James Cameron's The Abyss failed to meet expectations because of all the blockbusters that year, and The Abyss did 30% more at the box office thand did LTK. James Bond was old hat by that time. James Bond was ABC's Sunday Night Movie 1/5 of the year. James Bond was no big deal in a summer of big deals. I watched GoldenEye the other day, and it reaffirmed what a great Bond he could have been. He would have been Dalton Part II. If he weren't as old as he is I would have loved to see him in the role instead of Daniel Craig. Time moves on and Bean became too old. Brosnan was a good choice. Dalton was a better choice, and it's a shame that there wasn't a Dalton Bond movie in 1992 in between LTK and GoldenEye. You really do have to give the idea that if LTK had been released in the late fall/Christmas season as they have been since GE, it could have done better. It would have basically had the marketplace to itself in terms of action films. The only big action holiday release that year, to my recollection, was Tango and Cash, which did fairly well. Having a tentpole franchise film like Bond could have changed things. Somebody mentioned there was no way of knowing what the competing films were that summer. While it isn't the way it is today, with studios staking out relase dates years in advance, they had to know about the third Indiana Jones film and likely about the Star Trek and Ghostbusters sequels and maybe about Batman. I agree they couldn't have known how huge Batman would be or that Lethal Weapon II would be as huge as it was. The original was a hit, but nowhere near what Die Hard was. My theory is that Eon and MGM/UA were coasting at the time, thinking they could just throw something with the Bond name out there with a minimum of advertising and, to paraphrase another hit film that summer, if you show it they will come. With TLD they had the strength of a new Bond's curiosity factor and the 25th anniversary of the series to go on and with LTK it was just business as usual without considering the changing marketplace. Star Trek V also underwhelmed that summer, so it was newer franchises that were in. I don't think it would have done any better in the summer of 1990, which was dominated by other big action films like Die Hard 2 and Total Recall. People also may not recall that AVTAK went head-to-head on its opening weekend with Rambo, First Blood 2 and underwhelmed. Fall is a perfect place for Bond these days, it's where the franchise is associated with now and should stay there. I don't think its because of my nationality (not surprised by your arrogance), I think it is because you don't understand what a box office bomb is, even if its the lowest grossing film in the series, it seems it still made three times its money back and if your saying it 'tanked' in comparison to other Bond films, I believe it didn't. Thus your statement is senseless because the film didn't tank at all. ... UA-MGM also made a hash of the marketing campaign. IMHO the posters since LTK have sucked, including SF's humdrum effort (though I'm fond of the QoS print campaign) and LTK (which had wonderful teaser posters) got stuck with poster campaign more in-line with a Steven Segal movie. And yes, marketing campaigns do matter in crowded marketplace where a large percentage of ticket buyers are making a spur of the moment choice after not getting into their first choice. UA's marketing failure is definitely something to point to. They didn't market this movie at all. I was in college that summer and you youngsters will be surprised to learn we didn't have this new fangled internet. I heard absolutely nothing about this release anywhere - not on TV and in nothing I read. I only found out about it after it had been released. I regularly walked by one of the few theaters in town and accidentally happened to see the poster they put up after they began running it. Had I gone back home to stay that summer, it's possible I would have heard nothing of the release until the movie had left theaters! Lighten up, Francis. I was just having some fun with my neighbor north of the border. You did see the emoticon, didn't you? I think it is because you don't understand what a box office bomb is, even if its the lowest grossing film in the series, it seems it still made three times its money back and if your saying it 'tanked' in comparison to other Bond films, I believe it didn't. Thus your statement is senseless because the film didn't tank at all. Compared to all the other Bond movies when adjusted for inflation it did, indeed, tank. I love the movie, and it was marginally profitable, but comparitively speaking it tanked. And, R.Dittmar, TLD did less than AVTAK when adjusted for inflation. Edited by B5Erik, 02 December 2012 - 03:05 AM. They didn't market this movie at all. I was in college that summer and you youngsters will be surprised to learn we didn't have this new fangled internet. I heard absolutely nothing about this release anywhere - not on TV and in nothing I read. I only found out about it after it had been released. I regularly walked by one of the few theaters in town and accidentally happened to see the poster they put up after they began running it. Had I gone back home to stay that summer, it's possible I would have heard nothing of the release until the movie had left theaters! Same with me. one day I was driving by the theater and there it was. In fact, when I first saw it I thought it was a rerelease of TLD since the titles were similar. Your right. I could well stand corrected. It would only take a couple of years of 2-3% inflation to wipe out the nominal difference between the two films. That table does raise other questions though that complicate the issue. I noticed for example that there inflation adjusted increase for Thuderball over Goldfinger is about 594/526 = 1.13 or about 13% higher. The nominal increase is 64/51 = 1.25 or 25% higher. The movies were only released a year apart. Could inflation really have been running at some 12% that year? That seems pretty high to me. But then again, confusion has always been the goal of Hollywood accounting. No one there wants to admit that a movie failed so budgets are distorted, ticket sales are distorted and revenues are distorted. You can find all sorts of interesting other stuff in that table too. As I mentioned above, who would have thought that OP was as big a hit as it seems to be. Granted it was no TB, but it looks to have bested everything of Moore's other than MR.
TD is one of my favourite Bonds,I started liking the series after LTK but the truth was that it didn't help the series and all the press that followed that movie till GE was negative. The main issue was that audiences didn't warm up to TD's Bond. There were newer better action stars on the horizon who were making tons of money at the b.o and were big hits on video. Lack of humour also was a big downer. Even Batman,Last Crusade,Lethal Weapon 2, Ghost Busters 2 etc all had some form of humour. John Glen had run out of steam along with his team who had nothing new to contribute rather than go through the motions. Structurally the movie had no Bond quality (much like TWINE) . The most important thing is that no matter the actor that plays him the audience needs to accept him as Bond. It's not necessarily performance only but marketing and popular opinion matters. Much like DC's physique shown off during CR's marketing along with the amazing trailers. That kinda generated some likeness to his Bond and the good things to follow. This "adjusted for inflation" argument does not work at all since it only looks at estimated ideas of money but completely disregards all the other factors that influence the audience´s moviegoing behaviour. LTK was a great film lost in a changed marketplace that wanted the big BOND extravaganza, not a gritty revenge thriller. It's also not as though it really matters why LTK failed at the US box office. The success of SKYFALL has proven that something like this most likely won't happen again either ever or for a very, very long time. If a mediocre film like SKYFALL can make close to a billion dollars in a dire global economy like the one we're currently living in, despite having a marketing campaign even worse than LICENCE TO KILL's, then I have to wonder if they can ever pull off a box office failure like that again. It would take a real disaster of a movie, one to make DIE ANOTHER DAY look like a piece of cinematic perfection, to cause such a failure at the box office. Skyfall's marketing campaign has been epic and the best of any Bond and one of the best of any movie. No need to say provocative things if they have no base in reality. Edited by 00Hockey Mask, 02 December 2012 - 12:53 PM.